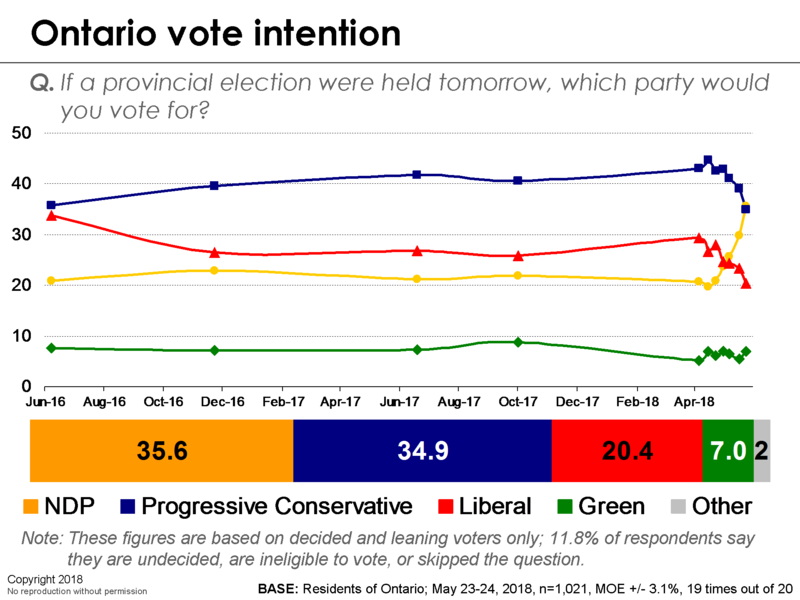 [Ottawa – May 25, 2018] With just 13 days until Ontarians cast their ballots, the NDP has seen a significant shift and now holds a statistically insignificant lead over the PCs in what is becoming a highly volatile race. Meanwhile, at just 20 points, the Liberals are being squeezed out of what has morphed into a two-way race and it appears that their 15-year reign may be drawing to a close. The volatility in these numbers appears to be a product of millennial voters, whose allegiances seem to shift on a daily basis. 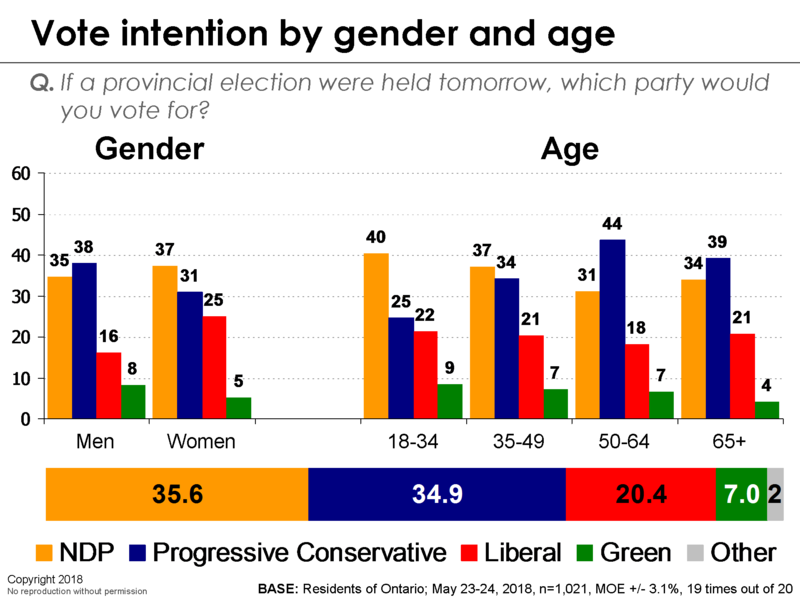 Whereas a week ago, the PCs enjoyed a modest lead with young people, that vote has swung decisively in the NDP’s favour. What happens with this group will ultimately shape the final outcome – they are the wild card in this election and it will be critical to keep a close eye on them. They are giving us different reads and their turnout will be uncertain. Indeed, this election may very well hinge on whether young people show up to vote. All in all, the race at this stage is highly turbulent and the poll results fluctuate from one night to the next. It is for this reason that we do not put out single-night results and, instead, prefer to focus on the broader long-term trends. The field dates for this survey are May 23-24, 2018. In total, a random sub-sample of 1,021 residents of Ontario aged 18 and over responded to the survey. The margin of error associated with the total sample is +/- 3.1 percentage points, 19 times out of 20. Showing overall percentages is almost useless as parties come to power based solely on the number of seats they win, NOT overall popularity. So why do you do this? It obscures the important details of riding-by-riding polls, unless, of course you are simply looking for a quick (and cheap) headline. Please STOP pretending overall percentages mean something because they don’t! You realize it’s the seats and not the popular vote that gets you elected . No , just ask Hillary. Hard to believe EKOS these days. Only ones worth focusing on are Nanos and Abcus IMO. Ipsos and Campaign research (yes, I know they can have a pro-con bias) try but not reliable enough. Ekos and Forum have become the laughingstock of the polling field. 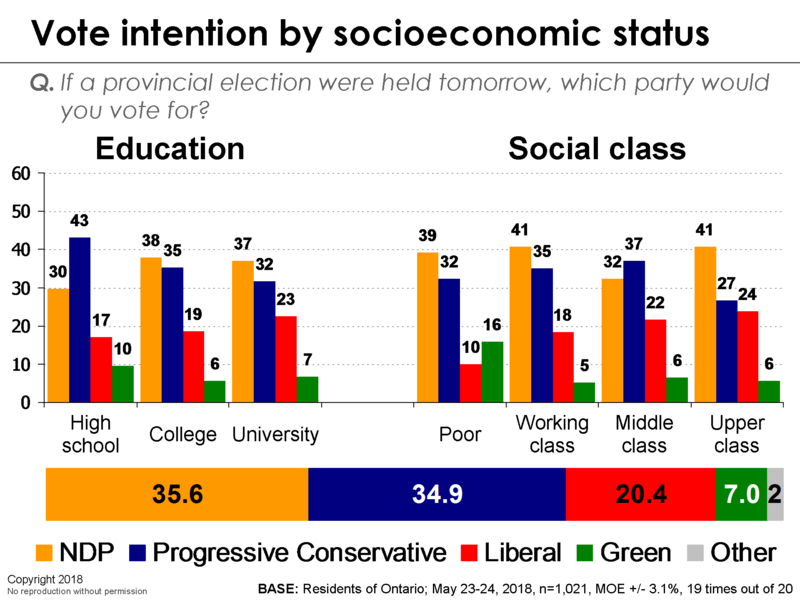 For example, are 16% of poor Ontarians really supporting the Green Party? I mean, seriously? Just a reminder to the critics here: EKOS predicted the last five Ontario elections accurately. And, correct me if I’m wrong, but Nanos hasn’t done a poll since April 29-May 6. If you want seat extrapolations, head on over to Eric’s site based on an aggregate of the latest polls. The numbers have changed dramatically; so the trends documented here do matter. How is the NDP stalled when it went up by 2.8% and the PCs by 3%? Please explain.